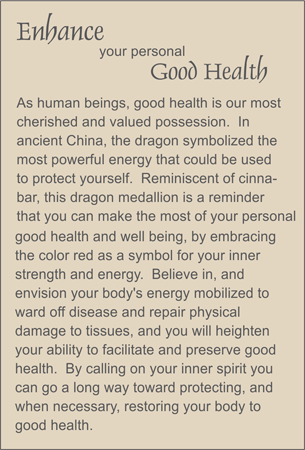 Cinnabar medallion showing the fiery Chinese dragon that can be a reminder to protect your health. (Resin over wood, as authentic cinnabar is toxic.) Accented with black agate, replica of ancient an Chinese coin, and black tassel. The dragon is the most powerful Chinese symbol for energy or "Chi."